It is by now common to most constitutions in Ibero-American LAC — including many of the state and provincial constitutions in federal republics of Argentina, Brazil and Mexico — to have environmental provisions, although they differ in content, context, clarity and detail. Most of these provisions are minimal, and have one or more of the following elements: (1) the right to a healthy environment (some add other qualifiers, such as “free of contamination” or “ecologically balanced”); (2) a general obligation on the state to protect the environment and/or natural resources; (3) an obligation for the rational and/or sustainable utilization of natural resources. The notable exceptions to the Ibero-American tendency to have green constitutional clauses have been Bolivia and the Dominican Republic; Ecuador may add an environment provision during its current constitutional reform, as might the DR in its current constitution reform effort. Many of the environment laws in these Ibero-American nations reference their constitutional provisions, making any challenge of the laws in question also a constitutional matter. Two non-Ibero nations, Haiti and Suriname, also have environmental provisions in their constitutions. Since neither one has a framework environment law, most environment regulations and rules must stand on their constitutional link alone. 36. In the interests of the present and future generations, the State will protect and make rational use of its land, mineral and water resources, as well as its fauna and flora, and will take all appropriate measures to conserve and improve the environment. The environmental provisions in most LAC constitutions don’t speak of future generations or “rational use.” I don’t know the origin of this provision — perhaps some reader familiar with Guyanese law knows? 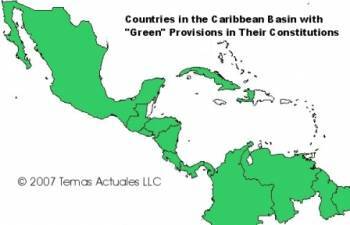 Why, with the notable exception of Guyana, do the constitutions of the English-speaking Caribbean not mention the environment? Some experts on West Indies law say it is because when they were drafted the emphasis was on “first generation civil and political rights” (right to life, privacy, etc.) and a few “second generation economic and social rights” (property, etc.) but not “third generation solidarity rights” (collective or community rights). 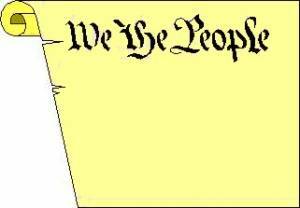 I would add that, while I do not know well the constitutional history of these nations, in reading their constitutions it becomes plain to me that most used the same template, and that there have been few major revisions since. Given how infrequently (and how timidly) the English-speaking Caribbean amend their constitutions, I wonder if environment advocates in these countries should spend their time and energies on getting a provision unless their constitution is up for other reforms. Absent such a provision, however, some of the less scrupulous governments might be tempted to exempt itself from land-use rules (such as Barbados seemed to do when establishing the Greenland landfill?) or sacrifice environmental protection for other interests, such as property development. Generally speaking, the arguments in favor of having “green clauses” in your constitution are (1) it prevents environment laws from being overturned on constitutional grounds because one set of rights (such as property rights) are constitutionally protected but the right to a sound environment is not; (2) it can allow for environment-related rights that, given a strong and supportive judiciary an/or Public Ministry, can be pursued and enforced even absent specific laws; (3) it can clarify key points, such as which level of government (local, state/province/department, national) action is most appropriate. In essence, it is up to the feds to set out minimum principles, but left to the provinces to flesh them out without altering local jurisdictions. Just what does that mean in practice? Argentine policymakers have been arguing that very point since 1994. Another example: Argentina’s constitution prohibits the importation of any “actual or potentially hazardous waste” — without defining what “potentially hazardous” means. That makes it nigh impossible for Argentina to recycle batteries or e-scrap from neighboring nations, even though it has the technical capacity to do so safely and they do not. So, are green constitutional provisions necessary and/or advisable? Necessary? My view is probably not, since some nations (notably the US) with strong environmental laws do not have explicit constitutional provisions on the environment. Below find links to the provisions I know about. If i have missed any, please let me know in the comments to this post or by email, and I’ll make and share the correction. This list of links will soon be added (and updated as needed in the future) as a standalone page in the “Temas Tools” section. Thanks for a marvelous posting! I certainly enjoyed reading it, you are a great author.I will ensure that I bookmark your blog and will eventually come back from now on. I want to encourage you to continue your great posts, have a nice weekend!